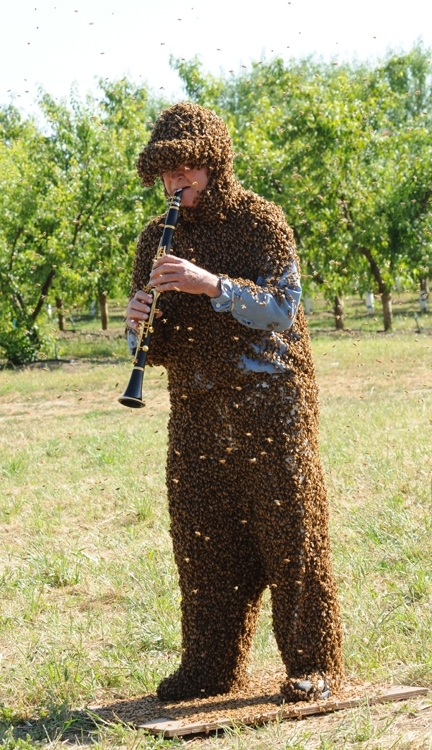 DAVIS--The Beez Kneez, a Sacramento-based band formed and led by Norm Gary, emeritus professor of entomology at UC Davis, will reunite for one last performance on Wednesday, Oct. 26 at the Straw Hat Pizza, 2929 Mather Field Road, Rancho Cordova. The group, which performed as a seven-piece band in the Sacramento area from 1995 until Oct. 17, 2004, will entertain from 6:30 to 9:30 p.m.
“Guess our hat jazz reached the ignition point,” he quipped. So there’s just one more—Oct. 26. They include "When the Saints Go Marching In," "If I Had You," "Just a Little While to Stay Here," "New Orleans," "Long Way to Tipperary" and "My Gal Sal." 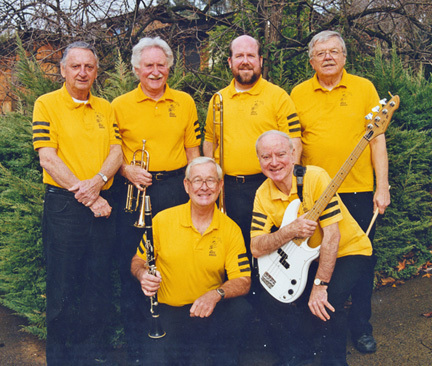 Norm Gary (front at left) and the Beez Kneez. DAVIS--Medical entomologist Robert K. Washino, whose career spans four decades at the University of California, Davis, has received the international Harry Hoogstraal Medal for Outstanding Achievement in Medical Entomology. Washino, a global authority on the ecology of mosquitoes and mosquito control agents, received the prestigious medal from the American Committee of Medical Entomology at the 54th annual meeting of the American Society for Tropical Medicine and Hygiene (ASTMH), held Dec. 11-15, 2005 in Washington, D.C.
Only 14 entomologists have received the medal since 1987 when Washino's mentor, mosquito-borne disease expert William C. Reeves (1916-2004) of UC Berkeley, won the honor. Washino not only worked several years with Reeves, considered one of the world's foremost authorities on the spread and control of mosquito-borne diseases, but “met and had coffee with” parasitologist-entomologist Harry Hoogstraal (1917-1986), a global authority on ticks and tick-borne diseases who maintained research facilities in Egypt. 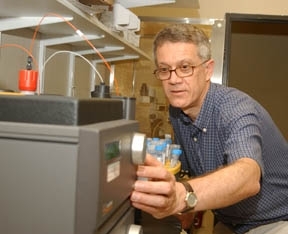 Last year John Edman, director of the Center for Vector Borne Diseases, UC Davis School of Veterinary Medicine, won the medal. Although Washino retired 13 years ago, he's been tapped or “recalled” for three administrative posts since 1996. He served from 1996 to 2001 as the special assistant to the dean of the UC Davis College of Agriculture and Environmental Sciences. On Nov. 1, he began chairing the Department of Entomology, a position he also held from 1981-87. In addition, he serves as the interim co-director of the Center for Vector Borne Diseases, UC Davis School of Veterinary Medicine. Born and reared in Sacramento, Washino never strayed far from his roots, except for two years in France as a medical entomologist with the Army Medical Service Corps during the Korean War. His parents, natives of Japan, grew hops on their farm in the Sacramento Valley. Later his father became a successful Sacramento florist shop and hotel owner. Initially interested in bacteriology (he received his bachelor's degree in public health in 1954 from UC Berkeley), he credits an epidemiology course, taught by the very same William C. Reeves, in fueling his interest in mosquitoes and mosquito-borne diseases. The work cemented his interest in entomology. He received his master's degree in entomology in 1956 from UC Davis and his doctorate there in 1967. In between, as an Army Medical Service Corps medical entomologist in France, he became interested in mosquito-borne disease outbreaks among rabbits. Washino joined the UC Davis faculty in 1967 and never looked back. Washino published 193 papers and abstracts on topics related to mosquito biology, ecology, and control. He co-authored the last complete treatise on the Mosquitoes of California. 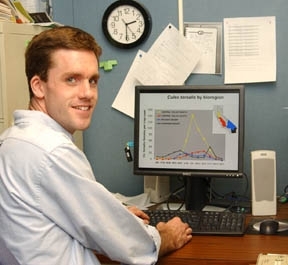 As a principal investigator, his research work was funded by the National Institutes of Health, United States Department of Agriculture, World Health Organization, and National Aeronautics and Space Administration and other agencies. Washino served as president of both the American Mosquito Control Association and the California Mosquito and Vector Control Association, and was active in organizations ranging from the Entomological Society of America to the World Health Organization. He's a former associate editor of California Agriculture. Washino said the district's surveillance program is “probably the most ambitious in the country. A laboratory on the district grounds bears his name. And now, the Harry Hoogstraal Medal for Outstanding Achievement in Medical Entomology bears his name, too. "I've led a very charmed life,” he said. 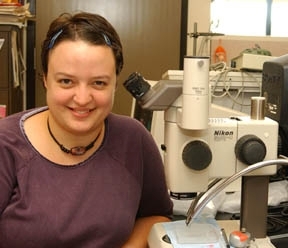 Since 1987, five University of California medical entomologists have received the coveted Harry Hoogstraal Medal for Outstanding Achievement in Medical Entomology. It is given not by year, but by merit. Parasitologist-entomologist Harry Hoogstraal (1917-1986), based in Egypt, was a global authority on ticks and tick-borne diseases.